This expansion offers new content for both the campaign game and the skirmish game. You can play a fully formed mini-campaign that challenges your Rebel heroes to rush to Han Solo`s aid or battle through a Mos Eisley cantina in the skirmish game. Two new heroes join the forces of the Rebel Alliance, but Heavy Stormtroopers and Tusken Raiders fight for the forces of the Empire. 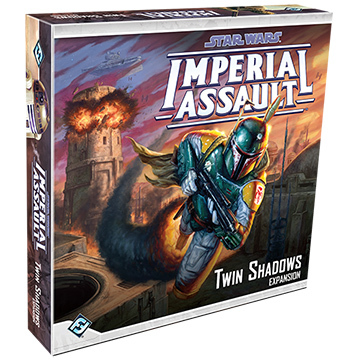 With ten sculpted plastic figures, twelve double-sided map tiles, and over sixty new cards, Twin Shadows brings new levels of danger and skulduggery to every Imperial Assault game.